What does the term "freeze-dried coffee"
Although some medical debate continues about the benefit and harm of coffee, amount of coffee people are not particularly reduced. Some of them refer to the fact that instant coffee does less harm to the body. Whether so it actually? And what kind of coffee should be given preference? Coffee is very invigorating. Such effect is achieved due to contained in the beans caffeine. In the ground coffee contains about 115 mg of caffeine per 125 grams, and soluble in twice. In other words, a Cup of organic coffee will provide a much greater energy boost. However, physicians publicly declare that caffeine is bad for the body, has a destructive effect and is contraindicated for people suffering from cardiovascular diseases. But instant coffee has no harmful effects on the heart, but on the contrary, even useful. According to studies, people who drink about 5 cups of instant coffee a day, far less likely to suffer cardiovascular disease than those who don't. Ground coffee for the experiment is not used, as in this case, it all depends on the method of its preparation. In turn, Japanese scientists have proved that the use of ground coffee, rich in antioxidants, reduces the risk of liver cancer, but instant coffee is harmful to use those who have increased the acidity. 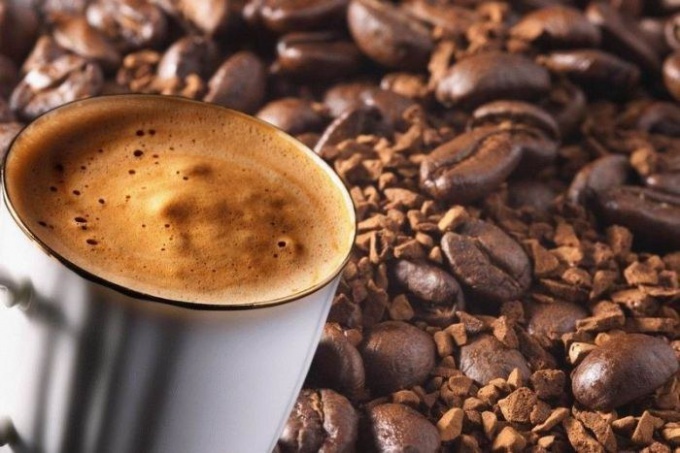 Furthermore, after prolonged treatment in a soluble coffee begin to accumulate carcinogens, able to cause the emergence of the tumor and the abundance of preservatives may cause metabolic disorders and, consequently, the formation of cellulite. If you're on a diet and don't know which coffee to choose, it really is not a big deal. Itself coffee, both soluble and ground, does not have much effect on weight, because these drinks are very low in calories. Harmful in this case would be coffee with milk, cream or sugar. In the case of instant coffee preparation method is not critical, as the properties of the drink are not changed, and it does not matter, poured you coffee cold or hot water. In a situation with ground coffee much more complicated. Some scientists have long conducted research, trying to identify the relationship between the use of natural coffee and cholesterol in the blood. Oddly enough, but it all depends on the method of preparation of the drink. In the case of espresso, when ground coffee is passed through steam, or with a simple boiled in a Turk, grains allocated colestrol and Cofer causing high cholesterol in the blood. But in instant coffee these substances are initially absent. To reduce the number of possible, skipping the prepared coffee through a paper filter. Some coffee makers included this option.